Boot from iPod shuffle into OS 9.22? I am writing this in response the article (link) you posted from David's Waste of Bandwidth. The symptoms that he states are exactly the same as what I experienced with my 1 GHz iBook G4. The root fault of the problem was mine. When I plugged in the power cord with the adapter already plugged into the machine, it puts an inordinate amount of stress (see surge) on a chip inside the machine. Something to do with the PMU I think. In the end, it took two system board swaps to resolve the problem. I have used it for the biggest part of a year since. Being extremely cautious not to plug it in that way again. Maybe this info can help some of your other readers. Since at least the mid 1990s, Apple has advised that one should plug the power adapter into wall current before connecting it to the laptop. This seems intuitively incorrect, but you have provided an explanation of why it is the proper sequence. Since this is a Pismo with the RAM on the processor card, I'd suspect the processor. I had the same problem on a Pismo that I got for half a loaf of bread, from a user who didn't know what was wrong and didn't want to fix it anyway! Mine was the dreaded L2 failure on the CPU card. It might need another daughtercard, 400 or 500 MHz. They both work - around 100$ on eBay. The lack of FireWire on all the iPods is yet more in the ever-increasing, frustratingly bizarre behavior by Apple towards its loyal customers who saw them through the bad times. USB 1.1 is bootable for Classic on post-dual-USB models (apx post 1991+) - but not for OS X! Why Apple would deliberately choose such a dumb thing is inexplicable (it is a similar move to the equally dumb idea to remove bootable RAM disks in new-world ROM Macs; both bootable modes are crucially useful in a troubleshooting pinch!). Since new Intel BIOS support bootable USB, it would be very interesting if someone could test this out (e.g. one of the iPod webzines). Word has always been that synching the iPod via USB is a miserable, unreliable experience, so some baseline viz booting USB would be in order (especially in light of Apple's own switch to x86 - we can only hope that these new machines will have something cool & truly different e.g. instant-boot via flash memory, as Intel's recent Robson demo suggests). Anyways, the call must go out the to open firmware hackers out there (I guess from the Linux crowd - gosh, don't they come in handy every now & again!) to see if it is possible to force OS X to boot from USB. Do you know of any way to manage an iPod shuffle using OS 9.22 and iTunes version 2? I am wary of upgrading the OS on my mother's 1998 iMac just so she can change the songs on her shuffle. Do you know any runarounds? Unless there is some hack that I don't know of (possible), it looks like you need to upgrade your Mom to at least 10.2.8. I have learnt more about this matter. To find out if you can rotate your screen, run System Profiler. If it says the Display (meaning the graphics card) supports rotation, then you can rotate your screen. Apple have implemented in 10.4 (possibly fully from 10.4.2) the ability to rotate the screen - if the graphics card supports it (this probably means Apple's driver supports rotation for that graphics card). Moreover, you do not have to perform opt-click; there will be a selection box automatically available in the Display System Preferences if the driver has support. To check that it was not some special function within Server, I swapped the cards around. I found the rotation capability was now swapped. From this I conclude the functionality is very much built-in and intended to be there, at last, but with restrictions. Then I looked at System Profiler and observed that it clearly states if rotation is supported or not! I have owned an ADi 17x+ rotatable CRT screen for a long time. The rotation never worked properly under Windows, and I never really got around to using Mac Classic. I am really glad to see full length pages again. Now what I need is a laptop with a rotating display. 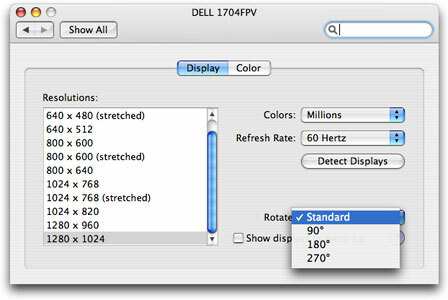 Tim Lee wrote that the Dell 2005 FPW had a worse viewing angle than the Apple display. They use the exact same Phillips LCD panel. I looked at both and bought the Dell. Speaking of display rotation, I have 10.4.2, along with a retail ATI 9800 video card in my G5 and don't get the rotate pulldown in the displays preference. I have to use the ATI Displays preference to get display rotation. I have an original beige G3 desktop I picked up used on eBay. When I got it, it didn't have a modem installed. Also on eBay, I found a replacement system board with a faster processor, more RAM, and the audio-video personality card with S-video jacks and an internal modem. I bought it and installed it, but the modem refuses to work. I even went so far as to get a different one from the seller, but it doesn't work, either. When it was suggested that I do a clean install of the System Folder, I tried that without success. I have also tried doing a complete reinstall from OS 8.5 with no luck. For whatever reason, I cannot get the modem Control Panel to give me the internal modem option - it only allows me to have the external modem or printer ports. I have been sure to have one or the other of these modems installed when I try these things, and most times the system doesn't even see it's there at all, so it doesn't load the drivers for the internal modems (but it loads every other modem driver on the disk!). I'm sure the modem is seated in the slot correctly and that the personality card is seated in it's slot correctly (I get sound from the speakers built into my monitor). The only other thing I changed was to remove the metal knockout plug on the back of the personality card to allow the modem to fit with the phone jack visible. Am I doing something wrong? I've loaded up to OS 9.2.2 as well, and still no luck. I'm beginning to think the modems are dead. I can't see any kind of jumper settings or cables I need to connect, and I've run this by the forum boards at EveryMac.com without success. Any assistance will be greatly appreciated. This is a kind of glitch that can make you tear your hair out. I doubt that it's anything you are doing. My guess is some sort of hardware problem. Two defective modems seems unlikely, but not impossible. There maybe some other issue with the board that is preventing it from recognizing the internal modem. I doubt that it's a software problem, since the external modems work. As long as there are no other issues, one suggestion would be to just use an external modem. Basing on Wozniak's suggestion to have more entertaining games for the Mac and the gap between the price of say a Power Mac to a DIY Athlon 64, it's best to say that [Apple] should partner with Nintendo with its Revolution console. It feels that Nintendo is keeping the competition off-track, saying that it has lesser graphics, no HDTV, that it won't use HD-DVD as media, and that's it's greatest strength is just the controller. With that kind of controller that is handy as a TV remote, it not hard to say that it should have HDTV, and then it's easy to say that they have a multicore on the ready, because high resolution means it needs more power. They also get their CPU from IBM, then for sure they have prototypes that are multicore. It needs to, because as soon as Sony says it too has gyros and depth sensors in it's PS3 controller, Nintendo will be in big trouble as Sony's console offers a lot more, the controller for the Revolution won't have that advantage anymore. Since the Revolution has announced its launch, Sony will just announce that it too has a similar controller that has gyros and depth sensors but having more features, people will wait instead for the PS3 or launch the PS3 at the same time. Nintendo will cease to exist. Because employees could be leaking stuff and there's nothing really that's unhackable (that companies should just innovate psychologically to keep them hacking, like if your Mac can play Nintendo, then even the hackers will buy it) , Apple's Mactel will get hacked to DIY PCs and then it will just have to rely on iPods for profit as it is doing now. To save Apple from being uncredible, they don't entirely have to reverse their switch to Intel but they just have to be patient since things have changed on the PowerPC. The truth on it before is not true anymore today. Interesting thoughts. However, I think the prospects of Apple shifting back to the PowerPC at this point are about zero. The PowerPC may well retain some advantages, but I'm inclined to believe that the Intel move was the right one in the broad context. it's too bad they are going Intel. I mean all those effort for PowerPC's gone. I'm not sure how it's sales on it's Mactels will become once hackers figure out a way to go around it. They've done that on the Tiger x86 (although incomplete). I hope for once if they're using Intel, they'll be as cheap as DIYs. It's lost it's uniqueness on the PowerPC. The OSes are not that significantly far apart for people to buy it, it's not like DOS/Windows 3 vs. System 1-6 anymore. I do hope that they still team up with Nintendo, I think a lot would enjoy playing their games on iMac G5s with multicore using a combo click wheel and Nintendo Revolution controller (add Front Row too). Apple needs mostly exclusive games anyway for people to really switch. But still I don't think people will switch. There's just too much software costs to replace, infrastructure (schools especially) and training to do.